Everyone has those days. For some they last for weeks. Maybe it was just one incident. You lost it. Raised your voice when you shouldn’t have. Or maybe you started an activity poorly and no matter how much you tried to save it, by clarifying something, talking, adding this, changing that, your hole to hide in never felt deep enough. You just felt like a failure. As much as we try and focus on growth and improvement, there is a voice inside that occasionally says, “You’re a charleton and now you have been found out.” Doug Belshaw identifies this as ‘imposter syndrome‘. The inability to internalise various accomplishments. This feeling of being a fraud often builds up, with one day here connecting with another day there. There is many an answer, sometimes it is talking with a colleague or other times you can gain critical feedback from students. However, the solution often lies within and needs to start with us. One remedy to regain balance is through blogging. Reflection allows us to highlight our positives and come back to the big question, why do we do what we do? I have written a bit about why to blog since I started. Recently I reflected on the uncanny nature of reviewing the past. However, another reason that I have come upon of late is the opportunity to connect back with your ‘why’. Your central reason for everything. Not everything I do is perfect. There are many moments where I lapse back into what John Goh describes as our ‘default’ value, that initial idea of education which we have internalised over time. However, it is important to stop and reflect in order to remind myself why I do what I do, as well as what I have been doing to support this. 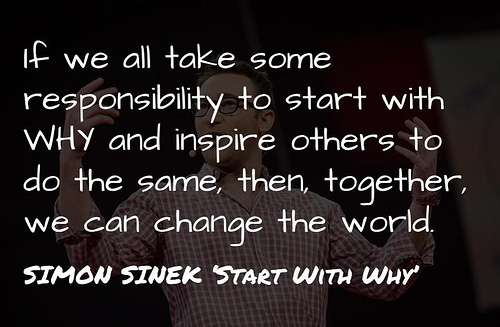 If it was important to start with WHY, then I would start with WHY in everything I did. There is not a single concept in this book that I don’t practice. How do you stay centred and maintain your ‘why’ in all that you do? I would love to know. Feel free to comment. Blogging Starts with Why by Aaron Davis is licensed under a Creative Commons Attribution-ShareAlike 4.0 International License. Why do I blog? I blog because it’s fun, because it’s encouraging that other people find it amusing, and because it’s a great way to connect professionally with people locally and globally. But the real reason I blog? Like my friend @acampbell99 says, it’s strictly selfish. I blog because it helps clarify my thinking. By blogging, I basically turn my website into my own reference point. I believe reflection is power, so my blog keeps me a superhero. If it’s not helping you, the why of blogging will soon dissipate. I keep it about me because it’s a metacognitive act, and because it also keeps me immune to whether or not I get high views or comments. Thank you for the comment Royan. I wonder if having the ‘why’ at the centre always makes everything somewhat selfish, but maybe in a good way. At it’s heart it is for me and I am fine with that. My ongoing point of reflection. I started blogging as a way to reflect on things I had done, places I had been and experienced that I had encountered. I found blogging a great way to channel my thoughts and primarily share all of the above. This was my ‘why’. It is my ‘why’. Although… I feel as though I have lost a little of this recently and have found it difficult to blog about anything really (besides the fact i feel my written english and grammar is deplorable!). I would say that I get a lot more satisfaction from reading blogs rather than writing my own. The ‘why’ comes from learning from others experiences and thoughts! Look forward to a catch up soon! Reading, listening and taking in is just as important. However, I will still stand by my statement about the importance of ‘responding’. Each to their own. I think what I love about your why is the importance of celebrating student learning that comes through in all of your writing.